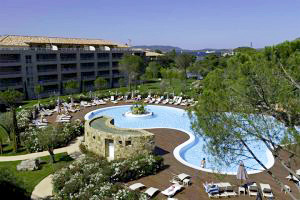 A modern résidence situated close to harbour and the citadel, with a large pool area. Set in an acre of carefully manicured grounds filled with pine trees, cypresses and laurels, this modern complex enjoys an enviable position on the outskirts of the town. 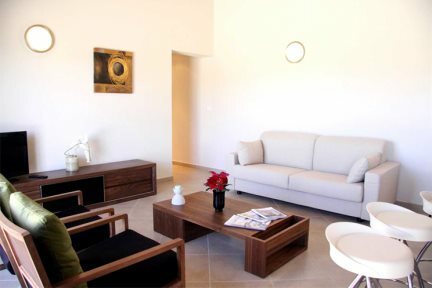 The apartments are spacious, well equipped and tastefully decorated in a minimalist style, with light wood furnishings and comfortable seating. Set over four floors, they all have a large balcony or terrace with some overlooking the town and others boasting delightful views across the pool, the marshlands and the hills of Picovaggia beyond (supplements apply). The large swimming pool area is a key feature within the résidence – surrounded by ample wooden decking and with its own swim up bar, guests can while away the hours here, soaking up the sunshine and enjoying a cocktail or two! Salina Bay is conveniently situated just a short stroll away from the harbour and a 15-minute walk from the old town – take a wander along the promenade and watch the yachts passing by or meander through the cobbled streets and discover the rich history of the old town. A great choice for couples and families alike, this modern résidence really showcases Porto Vecchio’s chic and cosmopolitan feel. "This was our third visit to Salina Bay and it was as fantastic as our first." 1 bedroom apartments (40m²): Open plan living/dining room with sofa bed and kitchen area, double bedroom, shower room, balcony or terrace. 2 bedroom apartments (70m²): Open plan living/dining room with sofa bed and kitchen area, double bedroom, twin bedroom, two shower rooms, balcony or terrace. 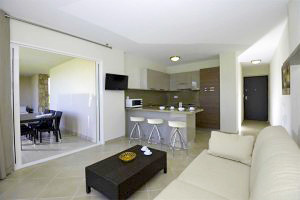 1 bedroom apartment with double bedroom, Open plan lounge area with sofa bed and kitchen/dining area and shower room. With town views. All apartments feature a balcony/terrace. 2 bedroom apartment with double bedroom, twin bedroom, Open plan lounge area with sofa bed and kitchen/dining area. 2 shower rooms. With town views. 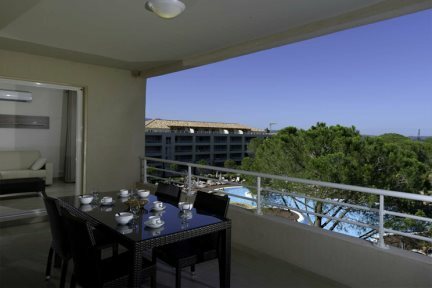 All apartments feature a balcony/terrace. 2 bedroom apartment with double bedroom, twin bedroom, Open plan lounge area with sofa bed and kitchen/dining area. 2 shower rooms. With pool view. All apartments feature a balcony/terrace. 1 bedroom apartment with double bedroom, Open plan lounge area with sofa bed and kitchen/dining area and shower room. With pool view. All apartments feature a balcony/terrace.